No doubt millions of UK TV viewers are glued to the new series of the Great British Bake Off anticipating the next great bun disaster. It's unlikely they are poised with pen in hand to copy down the week's winning recipe, even though we are lead to believe this long running 'cake-opera' is credited with bringing baking back as a national pastime. 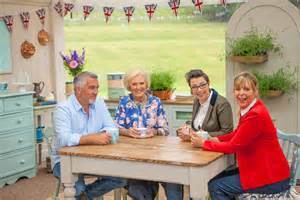 The better scenario is Bake Off lovers are sitting down with a packet of shop-bought donuts and a cup of tea to enjoy their Paul Hollywood moment. However, once more supermarkets are making sure they are ready to cash in on the show's popularity of stocking up on flour, yeast, 'hundreds and thousands' and piping bags. The high street giant Morrisons has hired its first 'bake officer' who, as well as ensuring essentials such as eggs are well stocked, will have to spot more unusual ingredients likely to be in high demand after being used on the show - known as 'the Bake Off effect'. Can you believe it? Anastasia Duncanson, aged 30, who has been given the role, (not because of her name!) is quoted in the press as saying there was an unprecedented spike last year in the store's sales of glace cherries and almond extract, up 163 per cent and 110 per cent respectively, after they appeared on the programme - ('appeared' - it's as if they were new cartoon characters!). 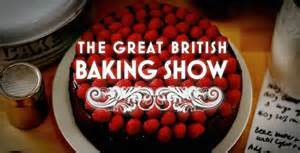 Meanwhile, the baking buyer at the posher Waitrose, Tim Shaw, has been quoted as saying that the programme is now the third most important event in the nation's home-baking calendar, beaten only by Christmas and Easter. Is that a fact Tim, who are you kidding? He told the national Sunday newspaper, The Observer, that he can predict the increase in sales of regular baking products, but the show always throws up a curved ball, with a contestant using a relatively niche ingredient which will then fly off the shelves. He says he will be glued to each episode, anticipating what that product will be. So will I, Tim! 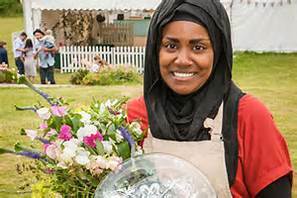 Last year there was a 180 per cent rise in sales of goldenberries, a fruit from Peru, after contestant Tamal Ray used them in his biscotti and a 315 per cent surge for crystallized ginger used by winner, Nadiya Hussain (below), on a cheesecake. Bake Off heart throb, Paul Hollywood has already let slip that the new series will see bakers experimenting with tea infused cakes. What's the betting he is about to release his own version to Sainsbury's!